Property losses make up a large portion of files that end up as insurance claims, often requiring the involvement of multiple parties to return the insured property to a pre-loss state, including insurers, engineers, and contractors. Fundamentally, under the terms of Ontario Regulation (O.Reg.) 297/13—Occupational Health and Safety Awareness and Training, failure to make parties aware of hazards and hazardous materials can be deemed as an offence chargeable under the act. In an insurance context, this obligation to disclose may well flow through to adjusters, contractors and their organizations more broadly. Understanding the requirements is critical, therefore, for all parties in the safe and proper execution of both simple and complex files. • Before beginning a project, the owner shall determine whether any designated substances are present at the project site and shall prepare a list of all designated substances at the site. • If any work on a project is tendered, the person issuing the tenders shall include, as part of the tendering information, a copy of the designated substances assessment. • The owner shall ensure that a prospective constructor of a project on the owner’s property has received a copy of the designated substance assessment. • The owner who fails to comply with Section 30 is liable to the constructor and every contractor who suffers any loss or damages as the result of the subsequent discovery on the project of a designated substance that the owner ought reasonably to have known of but that not listed in the designated substance report. In Ontario, designated substances are defined by O.Reg. 490/09 and include acrylonitrile, arsenic, asbestos, benzene, coke oven emissions, ethylene oxide, isocyanates, lead, mercury, silica and vinyl chloride. In addition, O.Reg. 278/05—Asbestos on Construction Projects and in Buildings and Repair Operations requires that an asbestos survey be completed to identify the type of material that contains asbestos, the type of asbestos presence, the location within the building, and the condition of the asbestos-containing material. This applies to residential buildings with more than four units. O. Reg 278/05 also makes clear the owner’s responsibility to have an asbestos survey completed prior to arranging or contracting for the demolition, alteration, or repair of all or part of machinery, equipment, building, aircraft, locomotive, railway car, vehicle or ship, even if no tenders are requested. The procedure for installing some friable asbestos-containing materials (materials that can be crushed to a powder by hand pressure) has been banned. 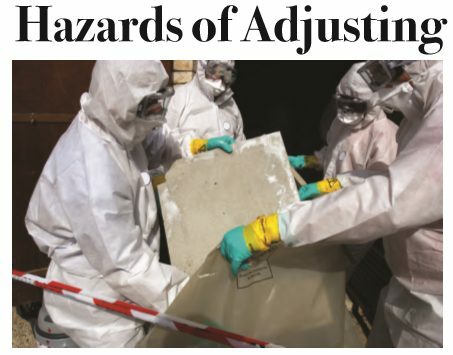 But be aware that regulations still permit the installation of non-friable asbestos-containing materials (materials that cannot be crushed to a powder by hand). 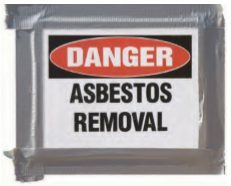 Regulations require the constructor to inform the Ministry of Labour when some specific types of asbestos abatement work procedures are to be followed due to disturbance of asbestos-containing materials. The notification to the Ministry of Labour is known as a Notice of Project, as outlined in O.Reg. 213/91—Regulation for Construction Projects. When the total cost of a project’s labour and materials is expected to exceed $50,000, or when a part of the permanent or temporary work is required to be designed by a professional engineer, a Notice of Project is required. One significant way non-compliance with OHSA requirements can occur on a property claim is after a Notice of Project has been made and the workplace in the building undergoes a Ministry of Labour (MOL) inspection. MOL inspectors show up to a building unannounced and must be granted access to all areas. An inspector will likely check that all documentation under the OHSA is in place and will then proceed to inspect the workplace to determine its compliance with the OHSA and regulations. If an inspector identifies non-compliance with the OHSA, several enforcement tools are available. An inspector may issue compliance orders, stop work orders, tickets under the Provincial Offences Act, or can initiate prosecution for non-compliance. These orders can be directed towards either the owner or the constructor and can bring an entire claim to a halt until the orders are complied with. The orders can negatively impact the relationship between the owner and the constructor, as owners can have different levels of involvement in the loss and little or no knowledge of their duties under the OHSA. Both aforementioned issues can complicate the execution and resolution of a property claim. A common non-compliance item associated with non-commercial residential buildings with more than four dwellings is the lack of asbestos surveys for management purposes and a lack of designated substance surveys for previous renovations. How do all of the above acts, regulations and inspection procedures directly impact the adjuster, specifically? 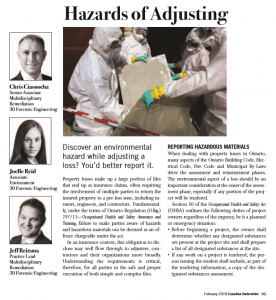 On a property loss claim, it is in the insurance adjuster’s best interest, in conjunction with the constructor and engineers on the claim, to ensure that the owner provides any OHSA-required documents that are already available. Assessment of loss-related areas can reveal an owner’s non-compliance with several aspects of the OHSA and can reveal that the compliance lies outside of the coverage of insurance policies, which can leave the owner responsible for the associated costs. The adjuster, the constructor, and/ or the engineers should ensure that the owner is in receipt of any assessment documents that contain recommendations relating to OHSA; this information should not be concealed from the owner. In addition, the constructor should provide proof of disposal — bills of lading, weigh bills, etc. — of designated substances to the adjuster and the owner, since the owner is responsible for the designated substances from the point substances leave the building or property until they reach an appropriate disposal site. The OHSA referenced above is applicable only to the province of Ontario, but each province administers its own act, designated substances regulations, and hazardous materials regulations. There are differences among the provinces, though many do require surveys for specific designated substances or hazardous materials as part of a renovation project, under which a property loss falls. All parties involved in assessment and remediation of property losses needs to be aware of their duties under the law, as well as the associated rules, so that they can best protect themselves personally as well as legally.